FileMaker Pro has grown up, and it's better than ever! This easy-to-use guide shows you how to design a great FileMaker application, build a database that works, add the functionality you need, populate your database, and venture into programming with ScriptMaker. You'll find out how to share and protect your database, too. Timothy Trimble is a professional computer geek, writer, and software developer with over 25 years of industry experience. He started as a video game developer and worked his way into the PC and PDA software development markets on various commercial, corporate, and vertical market applications. He currently exhibits his geekish tendencies as a FileMaker developer at SolutionMakers, Inc. (www.solutionmakers.com) in Woodinville, WA. Timothy has written a multitude of articles for various industry publications and wrote a book on flight simulation. He maintains a blog on the Art of Software Development at www.timothytrimble.info. Although he has significant publishing credits in the computer industry, he dreams of some day having his science fiction work published as well. When Timothy is not cranking away at the keyboard, he likes to be with his family, entertain his friends by singing and playing guitar, and door-to-door to tell others about his faith. 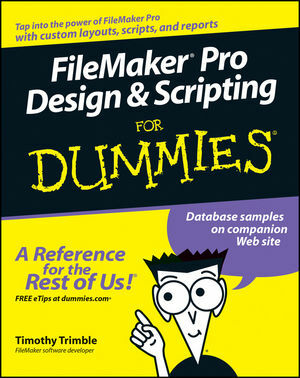 Feel free to contact Timothy with your comments on this book by e-mailing him at fmp4d@timothytrimble.info. Part I: Getting to Know FileMaker Pro. Chapter 1: Introducing FileMaker Pro. Chapter 2: Creating a Database. Chapter 3: Calculation Programming: You Have the Power! Part II: Building the Perfect Beast. Chapter 4: Designing a Good FileMaker Application. Chapter 5: Whipping the Layout into Shape. Chapter 6: Finding and Sorting Your Data. Chapter 7: Making FileMaker Do Tricks. Part III: Taking Control with FileMaker Programming. Chapter 8: It’s All in the Script! Chapter 9: Your Programming Toolbox. Part IV: FileMaker Exposed! Sharing and Protecting Your Database. Chapter 10: Share (Data) and Share Alike. Chapter 11: Batten Down the Hatches! Keeping Your Data Safe. Chapter 12: Putting Your Databases on the Web. Chapter 13: Ten Cool Things You Can Do with FileMaker. Chapter 14: Ten (Or So) Items to Aid Your FileMaker Development.